We have equipped the Pilot’s Discretion with what we think is a balanced electronics suite that should provide us with substantial navigational capability without getting crazy about a perceived need for all the “latest and greatest” gadgets. The life cycle of marine electronics is not unlike that of the computer industry, about every 18 months or so the engineers come out with a new generation of “stuff.” Don’t get me wrong, each new version of chart plotter or radar has some new feature that is more capable than what came before it but at some point you have to go with what you have. We have updated the electronics on the Pilot’s Discretion 3 times since she was new and what we have now is a mix of current generation equipment with some from the next most recent generation. We have two different chart plotters utilizing different formats for displaying data. 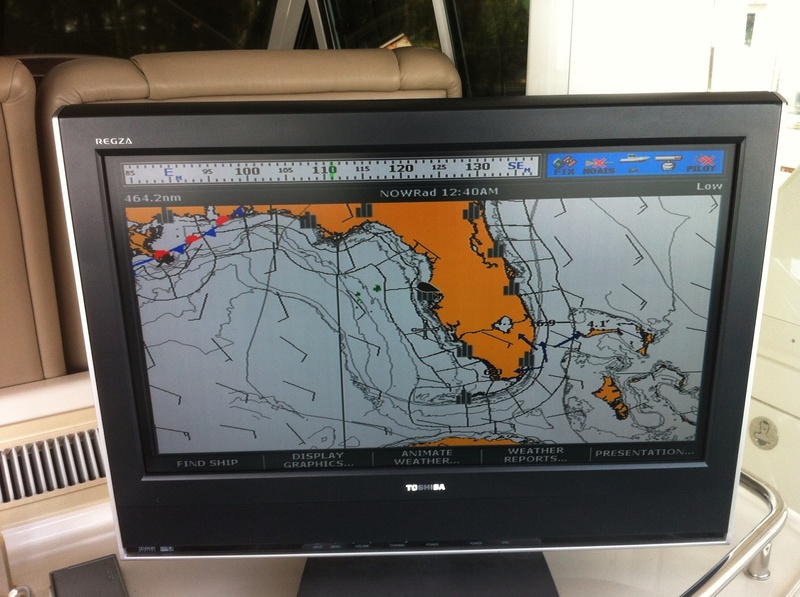 Our Raymarine E127 chart plotter has Navionics digital vector charts. Vector charts are made up wholly from digital data input and the result is a greatly increased ability to add additional data to a chart in layers that is far greater than what is displayed on typical old fashioned paper charts. That said, some people (us among those people) think that the presentation of the charted data is not as intuitive or at times as accurate as what is depicted on the old fashioned paper charts. That is where our second chart plotter comes in. 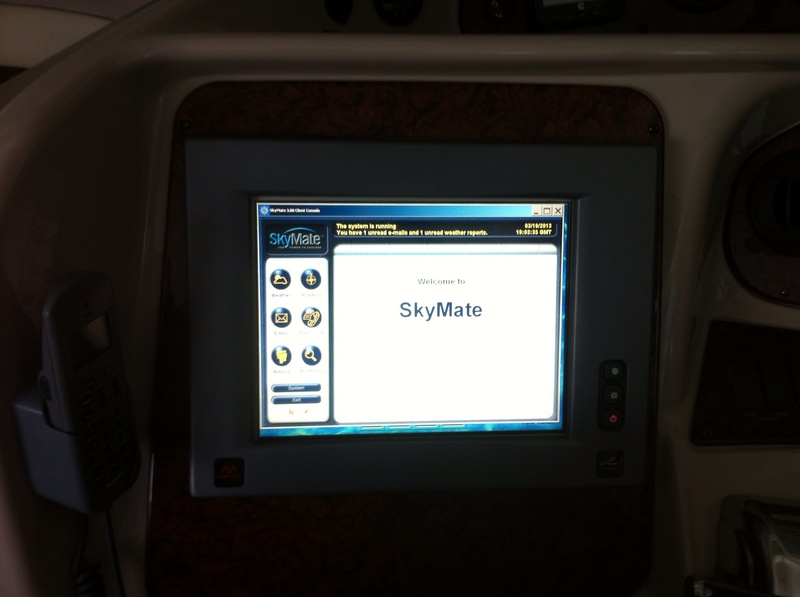 We have a Sea Ray Navigator (series III) that displays raster charts. Raster charts are actual paper charts that have been scanned and configured to display alongside the Vector charts on our Raymarine equipment. This gives us the ability to compare two different data sources side by side. Each chart plotter derives position data from it’s own independent GPS. Either chart plotter is capable of sending route navigation data to our Raymarine EV-1 autopilot to automatically steer the vessel. 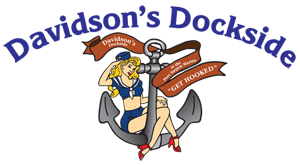 Additionally, we have two separate Raymarine DSM 300 depth sounders to provide us an idea of the bottom conditions below the Pilot’s Discretion. 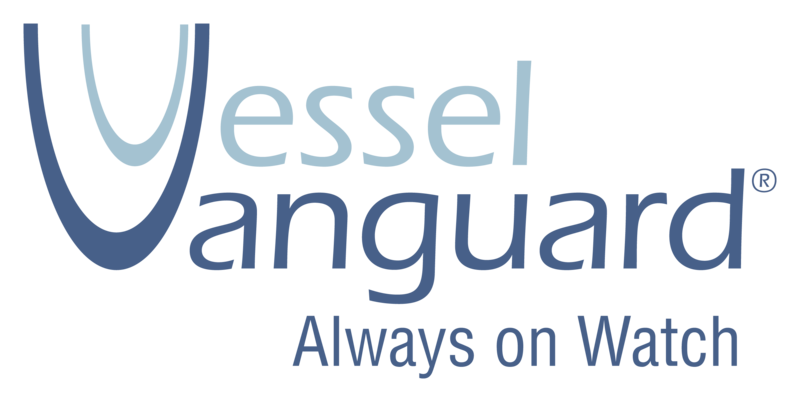 We have a Raymarine 12KW SHD 48″ open array radar as well as an AIS 650 (the marine equivalent of an aviation transponder) to allow us to keep track of other marine traffic in our vicinity. 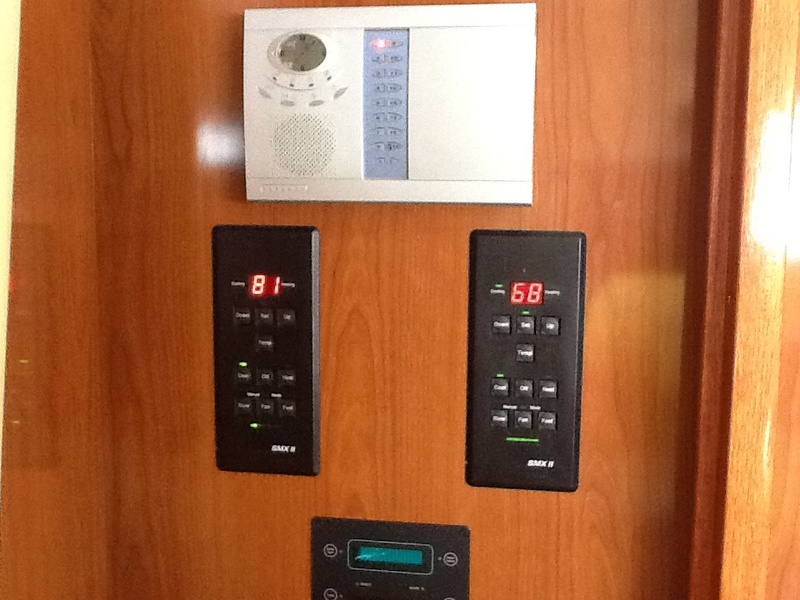 All of these systems can be displayed throughout the boat as we have networked the marine electronics to our flat panel TVs. 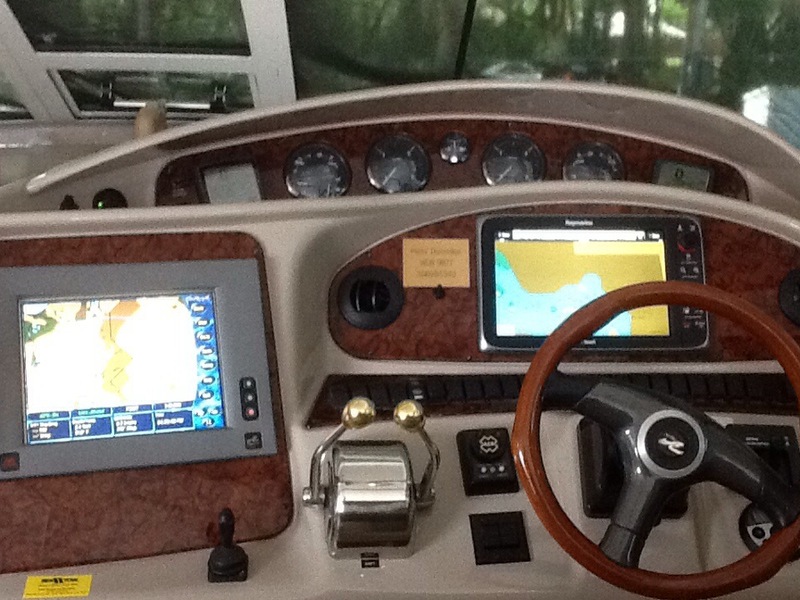 As a backup Nav system we are running INAVX as well as Navionics chartplotting software on our IPADS and IPhones. Irridium low earth orbit satellite system. We also have a Delorme InReach SE satellite hand held system that provides us emergency communications capability worldwide via the same Irridium constellation. 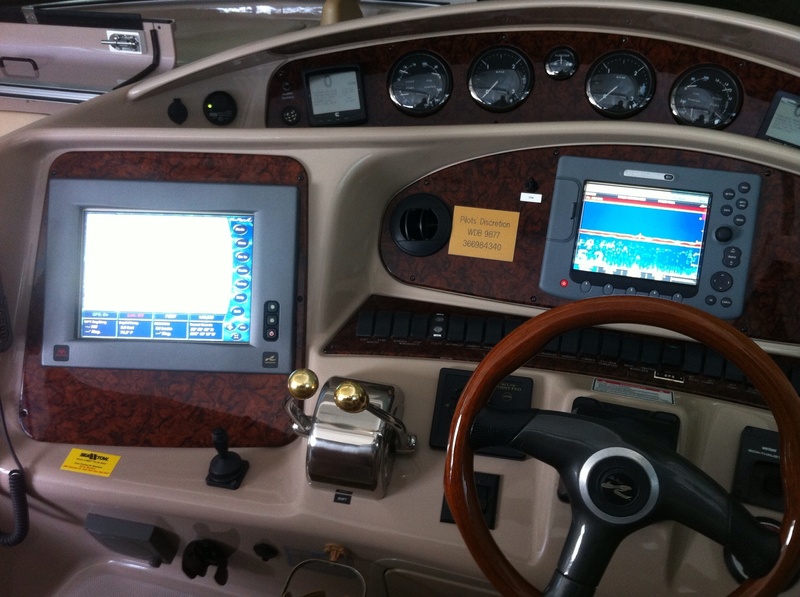 In addition, we have Sirrius/XM satellite radio with the added benefit of access to the Sirrius satellite weather system (Raymarine SR6) so that we can get real time weather data aboard. Finally, we have a Raymarine STS 45 satellite TV system to make sure that we do not miss any important San Francisco Giants baseball games while we are on our journey. We have installed a GOST Paradox wireless alarm system that is a combination of motion detectors, door and port light sensors as well as closed circuit low light cameras to ensure we do not have any unannounced visitors.